Way back when, we started our professional lives in theoretical physics. And sometimes it shows; we’ve never met a data set we didn’t like, and from time to time there’s an outbreak of ‘let’s see what we can do with this’. So it was with the database of more than a quarter of a million contracts let by Defence or the then defence Materiel Organisation between 2007 and 2014. As well as being a useful source of information about expenditure on particular items or projects—thus offsetting to some extent the lamentable lack of transparency that’s otherwise the case from Defence—there’s enough data there to conduct some macro analysis. The obvious question is why? It turns out that this is a general property of large data sets with a couple of not-so-unusual properties and Power Law distributions are common in science and economics. In the late 19th century and early 20th centuries, Power Law distributions were observed in income distributions (Pareto ), word frequencies (Zipf’s law ) and the distribution of population size in cities (another Zipf’s law , explained in a technical paper here  (PDF). Journal citations, book sales, earthquake magnitudes, company size, stock market movements, web hits, individual net worth, executive remuneration and even the diameter of craters on the moon  (PDF) follow the same pattern. Regardless of the reason, the distribution does what it ought to, and it also mirrors the distribution of contracts let by the US government. 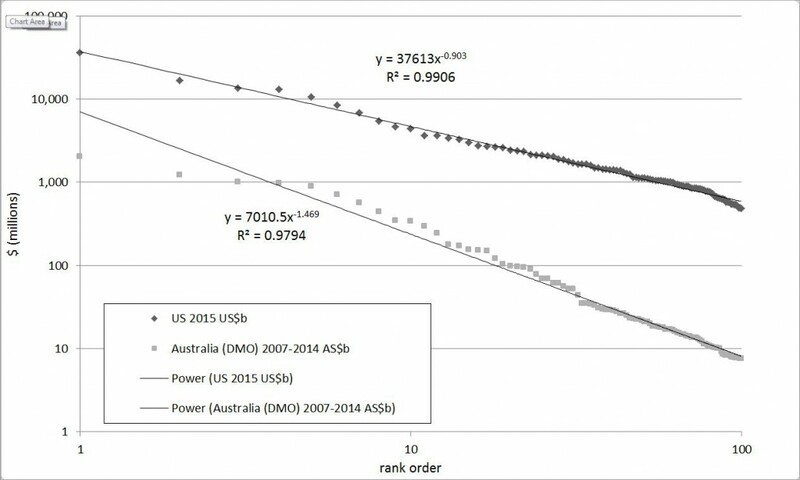 Presenting the data in a slightly different way, the graph below shows the value of the top 100 contracts let by the US government and by DMO, ordered by contract size. The scale is different (the largest American contract is US$36.3 billion to Lockheed Martin, while Australia’s largest is a little over AU$4 billion as part of the air warfare destroyer project) but both follow a power law with more than 97% correlation. 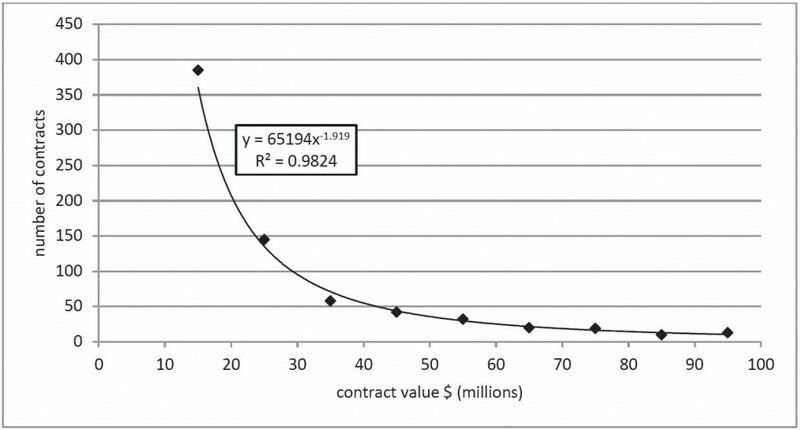 The graph below shows how DMO’s contracts stack up against Benford’s Law. 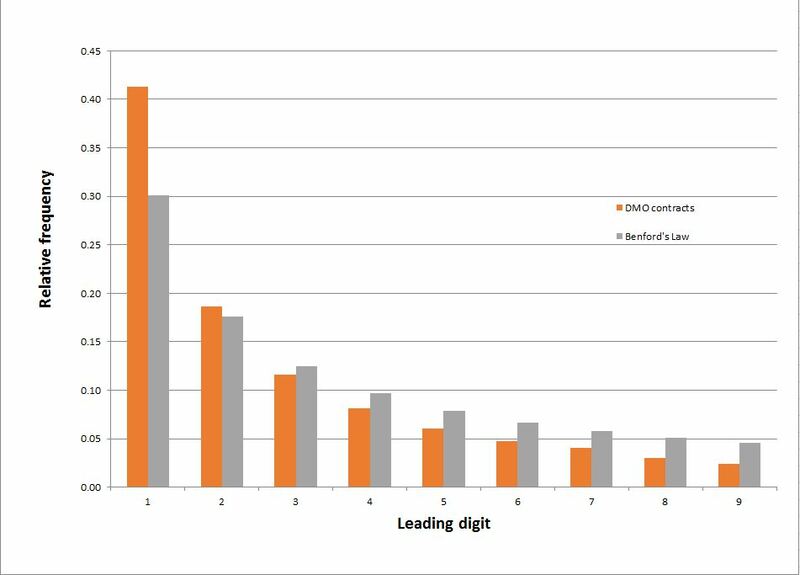 It’s not an exact match, but the relative frequency falls off progressively by digit as expected. 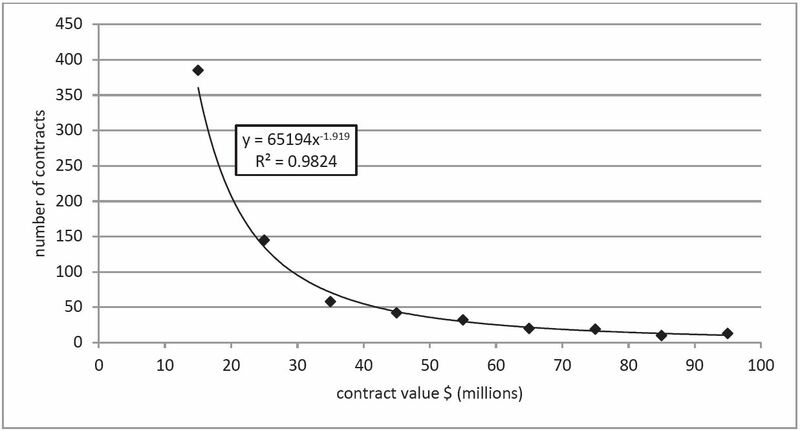 The difference is probably due to threshold effects in the contracting and approvals system—a glance at the raw data shows a sudden leap in the number of contracts at $10,000, for example. Source: ASPI analysis of AusTender database. Overall, our analysis results in what a scientist would call a ‘null result ’. That is, there’s no clear evidence of anything beyond the ability of mundane explanations to describe. In this case that’s a good thing—we don’t want to find exotic phenomena in Defence’s spending habits! Andrew Davies and Mark Thomson are senior analysts at ASPI and lapsed physicists.